WAIT LIST POLICY - We will call and reconfirm your reservation 36 hours in advance. If you DO NOT respond back within 24 hours, reservations will be cancelled and wait list people will be called. 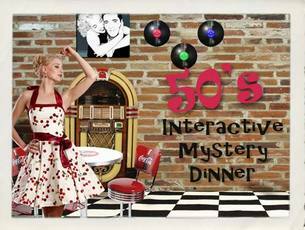 Join us for an interactive 50's theme mystery. Bring everyone to this family friendly event! ​Doors open at 6:30pm, dinner at 7:00pm and lasts about 3 hours. Receive news and special offers in the Occasions Divine Email Newsletter.